An exploration of why soccer is beautiful and how its beauty (and occasional ugliness) manifests. Critchley (Philosophy/New School for Social Research; ABC of Impossibility, 2015, etc.) is a passionate soccer fan. Though he is a supporter of Liverpool in the English Premier League, his commitment to the game extends far beyond club and country. He has written a number of books geared toward bringing a philosophical eye to popular topics, and here he tackles perhaps the most popular of all with wit and verve. The author is not attempting a “philosophy of football” per se but rather an exploration of the “phenomenology” of the game—i.e., “the description of what shows itself to us in our everyday existence.” This might initially seem like jargon to some readers, or a distinction without a difference, but to those who allow Critchley leeway, this slim book will provide many pleasures. For one thing, while the author is a deeply devoted fan, he is not a blind one. He acknowledges many of the problems that come with being a fan of sports in the modern day: the excesses, the racism, violence, sexism, and hypermasculinity, the insane amounts of money at the highest level of the game. He is aware of some of the innately stupid (his word) aspects of being a soccer fan, but he is also aware of the intellectual aspects to the game. Even with the philosophical nature of the book, it is successfully aimed at a nonacademic audience. Furthermore, Critchley peppers the book with compelling photographs from the history of the sport that also help illustrate and give life to the narrative. 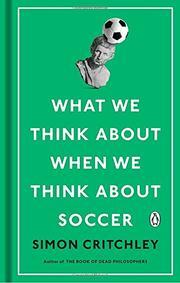 Naturally, soccer fans will get more out of this book than fans of other sports, but anyone who is passionate about a game and is willing to read a smart assessment of what it means to be a fan will find much to admire.